Why do the efforts of biodiversity groups such as Conservation International receive less attention than climate-change studies, though they are equally crucial? This question from Tom Friedman has been on my mind. After all, I am just as guilty as the rest of my fellow bloggers. I can only remember once writing a post recently about the bees. 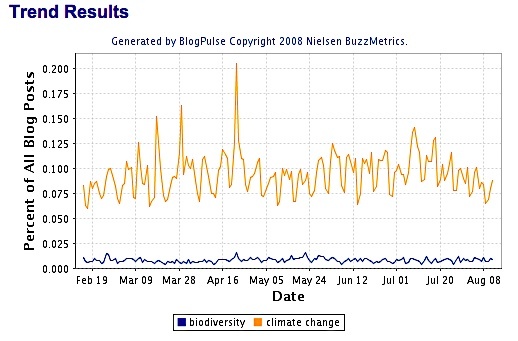 That biodiversity suffers from a PR image, was confirmed by a November 2007 Gallup Survey, on “Attitudes of Europeans towards the issue of biodiversity”. Published by the European Commission, the survey reveals that, only 35% of Europeans know what biodiversity mean, and most see no immediate personal impact of biodiversity. It also shows a lack of understanding of the causes and consequences of biodiversity. I spend a lot of time with biology types. They’ll tell you the impact of the sea level piece of global warming may be trivial compared to species extinction – something that is accelerated with poor biodiversity. Thanks for your feedback. I just did a quick survey tonight at the dinner table, with six teenage girls, all seniors in high school. Not one was able to tell me what biodiversity means. These are ‘well educated’ young women. . . I am just now realizing the magnitude of the task. It’s just that biodiversity is such an abstract thing to most. I mean, higher temperatures, more storms, running short of oil, even seals being clubbed to death – people can make sense of that. But not many people know how many thousands of species of bacteria live in just one cubic foot of soil, and why it should matter if any of them die. In fact, most species of creatures, their very existence is unrecorded, let alone are they studied in detail. All we know is that each time we dig up a cubic foot of soil and study it, we find more thousands of bacteria species, another few worm species, some more bugs, and so on. In that chain of life, where is the weak link? In our bodies we know that if we lose our heart we’re dead, if an artery is severed we’re at risk, if a tendon is cut we can’t walk, and so on. But where in the web of nature is that weak link? What should we fear being harmed? Everything? Nothing? Something? In which case, which something? Climate change and resource depletion also have the advantage that they can be measured, given numbers. But not biodiversity, or at least not number which mean anything to anyone outside very narrow PhD studies. This is an issue which even biologists find difficult to grasp… so I don’t see how we’ll manage! Then, we could explain to people how the destruction costs us a lot each year. The United Nations did some research on that it is … staggering. Keep up the good work and enjoy ! I still need to be educated on the subject of biodiversity. It feels like I have a blind spot. Does anyone know a good blog? Kyle, I do not share your pessimism. I think it is a matter of environmental education, and smart messaging. Simplifying, and making it digestable for people like me or the girls sitting at my dinner table last night. There also needs to be greater emphasis in school curriculum. I was told by my young friends that that kind of thing is taught in Environmental Studies, which is an optional course in Senior year! Edouard, thank you so much for the great link. If you discover some mores, please let us know! It is sure that biodiversity is a huge topic that can be really difficult to explain. But indeed, solving this problem is as important as solving the energy / environment equation. In the 1970s, the Seine river in Paris had only one species left of fish because of excessive pollution. Since then, the Seine pollution has decreased and now around 20 (or 30, don’t remember) species of fishes are present. In an article published online this week in the journal Proceedings of the National Academy of Sciences, the researchers argue that substantial die-offs of amphibians and other plant and animal species add up to a new mass extinction facing the planet. There is a great John Muir quote about everything being connected and interdependent . . . along the lines of, if you try to single out one element (such as human beings) you find that you can’t, because all aspects of the overall biological circle of life are connected. Muir is much more eloquent. I think I may have sent you (Marguerite) that quote, but I can send it again if you’d like. Also, and importantly (VERY importantly), an understanding of morality/ethics itself, from the ground up, deeply explains how biodiversity is (by definition and necessity) within our circle of moral concern, or at least SHOULD BE within our circle of moral concern. And, of course, the term ‘biodiversity’ is positioned as a soft environmental consideration, not to be taken seriously by tough guys drilling holes or tough guys building housing developments or tough guys stripping coal from mountaintops. If only all those tough guys had taken biology in college! But, I guess biology is one of those tougher subjects, and paying attention in class is tough too, so all that is not really for tough guys being tough drilling holes. Sorry for my mood today. That’s interesting, Jeff, that distinction you make between soft and tough topics. I have been thinking along similar lines. Solar, clean tech, even climate change are a lot sexier than biodiversity and energy conservation, two areas that could be easily fixed if only we were more aware and willing to put in the effort. Don’t be sorry for your mood. Frustration can be a great motivator. May you use it productively. Keep on commenting! If you think about it . . .
Sustainability IS wise, and indeed sustainability and wisdom are deeply linked, in several deeply-rooted ways. Meanwhile, many of the things that we (society) think of as “tough” are actually more accurately characterized as downright stupid. True wisdom and toughness aim at sustainability. Stupidity and weakness ignore sustainability. With a tip-of-the-hat to this blog (but a well-deserved one), my guess is that more females are likely to “get” this than males, although there’s alot of overlap, of course, and I hate to pose a possible simplistic generalization. So, the next time your males want to show they are tough by drilling a hole or messing up a mountaintop or buying a Huge Hummer, please suggest that they take some biology and rethink their toughness. If they don’t get it, and you can’t help them get it, you may want to trade them in for a more intelligent model. Thanks Marguerite. I’ll try. Cheers. The term is fairly new and I think mostly popularized by EO Wilson. I don’t think there is a precise meaning and I dislike it as it is hard to separate the concept from meaning everything. As such I don’t think there are meaningful objecdtive measures. But it may be useful as a concept to make points to non-biologists (such as simpler people like me). To me it represents a shift of biology and ecology from the little bits and pieces to a systems view that recognizes the importance of interconnections. This web of connections evolved with time and is massively complex. Removing elements from it endangers much more than the individual points removed. Ultimately new components and connections evolve, but this can take tens of thousands of years and we are seeing change on the order of decades. For all intents and purposes (in our life times through our grandkids, grandkids grandkids grandkids grandkids grandkids,,,, lifetimes) the changes and losses are irreversible. Some of these links may be important or even necessary for our survival and we only understand them at a cursory level. So when I talk with EO Wilson and he frets about it, he is talking about the local irreversibility of the destruction of a massively complex system. Things will get very different. We, and our fellow creatures, can live with much of the change. We may not be able to live with some of it. – much more worrying to me than things like sea level change. Marguerite – I’m answering your twitter about what ‘biodiversity’ means to me. I certainly don’t have a short and concise definition of biodiversity on hand. When confronted with the word, I had to break it down, and start excavating what I know about it. We have been composting for a little while, so I know something about healthy soil needing a diversity of life forms. I’ve read about various ecosystems and the interconnectedness of species, etc. From there it went fairly broad: variety of food crops, healthy diet, cultural diversity, etc. I know it’s not all technically ‘biodiversity’ – but those are the associations that came up. If the term ‘biodiversity’ can provoke some puzzlement/consideration/conversation all the better! Thanks Ethan. Pleasure to connect again! Your Netbody projects seem fascinating. And actually converge with some of my other interests regarding intersection of physical and virtual worlds/identitites. . .
Back to biodiversity, I do not share your appreciation for the value of mystery. Not many people share your inquiring mind, unfortunately! I believe the public at large, needs to be engaged around some clear, concise communication. This of course, does not preclude soliciting the imagination, and the heart! Biodiversity could be made harder by linking it to resilience, it could be made more emotional we can link it to health, and it could be made more valuable by linking it to knowledge and wisdom, nature’s experimental wisdom. The last thing can also be used as an argument for protecting cultural diversity, which is possibly even more at risk. I think it’s always important to explain things in terms people care about. Why should someone care about diversity? It’s not immediately obvious. This could be a great topic for Framing Science. You know, one part of me doesn’t believe the interconnectedness/interdependence part. That is, not that “everything” is interconnected. Do we really need anything in the sea? I mean, what would happen if the sees were totally dead? Would it affect life on the land? Would it affect agriculture? Meryn, your last question proves this post’s point. We already have this Ten things you can do to help biodiversity – (although that should be in html, on a blog) – but first I want someone to make the case for its value. We as a society are basically brain-dead (excuse me, I’m getting more forceful with my words sometimes) when it comes to understanding our dependence on, and interdependence with, the rest of the natural world. One of the reasons is that, in many ways, we do everything possible to hide or separate ourselves from signs of that dependence. How many people have seen where their garbage goes? Where their Pee and S go? Where their hamburgers come from? Where their boneless-skinless-chicken-breasts come from? In this area of California, the nice restaurants serve Salmon alot, and people love Salmon for dinner. I wonder, how many people know what a Salmon goes through in its life-cycle, the perfect example of a species that swims and struggles upstream? I think Meryn’s point/question is a good one, though. How do we help people understand the genuine interconnectedness when we do everything possible in society to hide it and pretend it’s not there? If you asked a Native American a couple centuries ago about how interdependent humans are with nature, you’d either get a very long answer or a laugh. Nothing has changed since then, other than that modern societies have moved our interdependence from the view of most average people. The fishing fleets are at sea. The farms are often in areas of very low population. The cattle ranches are also hidden away, unless you live nearby, in which case you can smell them pretty well. And so forth. Cheers for now. Go E.O. Wilson! Thanks, this is a wonderful post. I’m so glad E. O. Wilson’s gettin’ some love here! Marguerite, I share your and Eduoard’s befuddlement re: insufficient support for exploration of biodiversity in High School as well as in younger grades. How might we best be able to serve youth by helping redress this failure of our current educational systems? Perhaps such a methodology could be put to good use in exploring how to engage young students (and their teachers and parents) in learning about the relevance of biodiversity to various other subjects they’re already studying in school as well as its relevance in the so called “real world” they’re being prepared to enter. P. S. – Does the following quote from good ol’ Albert Einstein seem relevant to anyone else here? P. P. S. – Marguerite, your home-boy Teilhard is prominently featured in the above “newciv.org” and I believe his quotes may help us gain a better understanding of the kinds of actions we may be able to take to ensure young folks (like your daughter and her friends) are given a fighting chance to enjoy their lives for years to come. Paul, thanks for the great thoughts, and thanks for the Einstein quote. I have some thoughts on this subject but not enough time to write right now. Marguerite, a great and revealing article in The New York Times today that will probably interest you and that relates to many of the subjects in LaMarguerite: “Home Equity Frenzy Was a Bank Ad Come True”, by Louise Story (love her name! ), on the front page. Jeff, agree that technology has given us the illusion of human independence from nature. Hence, many of our current problems. Reading E. O. Wilson’s “The Creation” (almost 2 years ago), I was thrilled to learn of his open-to-the-public learning endeavor = inviting anyone/everyone to participate in the discovery of all sorts of life-forms that have yet to be identified/appreciated. I’m so glad he’s still warmly welcoming public participation (under “Help Us”, see “Become a curator …” and “Provide content …”) and putting the www to such good use. Hi Marguerite: Question: How do I put a little picture into that little square next to my comments, like you have a flower and Meryn has a portrait shot and so forth? I’m hoping it’s easy, because I’m not so good at computer things. Thanks. it is currently estimated that this planet is now losing an average of one specie every 20 minutes. this is nothing short of a catastrophy for earth’s web-of-life and many elements within it. Thanks Philip! This is exactly the kind of info that makes a strong impression on the public imagination. It certainly did on mine! Jeff, I will mail Meryn to ask him for his help here. I am not sure how thumbnails work on the reader’s end. Thanks for the info Paul. These are great links. I believe some folks here may enjoy this young woman’s glimpse of biodiversity that includes a bee dying and a new-born human. Something to be said for having a sincere voice. Great question! I believe much of the problem lies in how difficult it is to associate an economic benefit with passive environmental attributes. By this, I mean the benefits we derive from just leaving certain ecosystems as they are rather than destroying them. A great example of this is the water purification process for New York City. Instead of buying up the land that has traditionally made sure that NYC has some of the best drinking water in the world free of charge, the powers-that-be failed to protect certain areas from developers and are consequently planning very expensive water purification plants. Biodiversity is similar in that very few people understand what’s in it for them to leave species intact. I’ve addressed this to a certain extent in my series on why we have to protect the commons. If you can make a case for biodiversity as the agent for intact fisheries, robust crops, and countless other benefits that we’ll only realize once they’re gone, you might be able to persuade some people to care. However, humans almost always put personal, short-term interest ahead of the good of society. Great link, Mike. I like that notion of ‘commons’. That needs to be emphasized more. Because we ‘own’ nature and all it entails collectively, does not mean we should care less for it. Also, I agree with you that it is very difficult for humans to appreciate what has been granted to us from birth. Things like trees, and birds, and all the invisible species within the soil, and the waters, that all conspire to keep us alive and well. i feel like were ( humans ) not gonna stop this. the only way we will change is when we don’t have a choice. its gonna be bad.